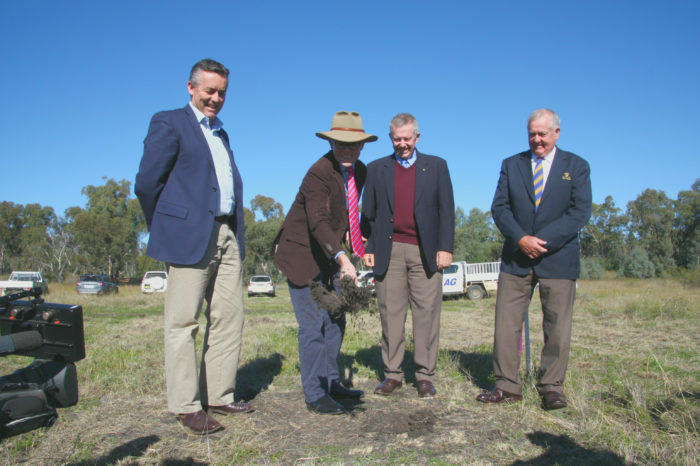 Member for Northern Tablelands Adam Marshall, Member for Parkes Mark Coulton, Gwydir Shire Council Mayor John Coulton and Federal Minister for Infrastructure Darren Chester inspect designs for the $6.5 million Warialda Bypass at the planned site. WARIALDA’S long awaited bypass is now just around the corner, with $6.56 million in funding now locked in from industry and all levels of government. Member for Northern Tablelands Adam Marshall made the announcement in Warialda today with Federal Member for Parkes Mark Coulton and Gwydir Shire Council, who are jointly funding the project. Mr Marshall said the NSW Government had pledged $3.03 million to the project from the Fixing Country Roads program. “I took the community’s concerns to the Roads Minister earlier this month – and she agreed something needed to be done. With all funding approved, we can get started on this important project straight away,” Mr Marshall said. The 3.6 kilometre bypass will take heavy vehicles from the north of Warialda along a new route to the east of the township, over a new bridge on Warialda Creek and onto the Gwydir Highway. The route will also incorporate a new truck wash and effluent disposal point. “This bypass will allow heavy vehicle traffic to avoid the challenging pinch point at the corner of Stephen St and the Gwydir Highway in Warialda,” Mr Marshall said. “Currently B-doubles have to cross the centreline of both roads, which slows down traffic and presents a significant hazard to traffic and pedestrians. Road trains can’t yet legally pass through the town at all – adding nearly 150km to the journey north. The Federal Government has pledged nearly $3 million to the project through its Heavy Vehicle Safety and Productivity Program. Member for Parkes, Mark Coulton said “this is a great example of Federal, State and Local Government working together”. “They have found a problem and solved it and will improve the economic productivity of the Warialda and district community,” Mr Coulton said. Gwydir Shire Council Mayor John Coulton said the community would be very pleased to see the traffic hazard gone for good. “There’s not the radius to allow heavy vehicles to go around – they’ve got to cross right onto the footpath to make the corner, and the community was very concerned,” Mr Coulton said. Gwydir Shire Council had several plans to fix the corner, but hit some infrastructure that could not be moved. “It was prohibitive to alter the corner, so we needed to look at other alternatives,” Mr Coulton said. “We’ve been lobbying for a bypass for a couple of years – it was the first council after amalgamation that first considered an alternative route, and it’s been talked about and worked on since that time – it’s a wonderful result for the community.” Mr Coulton said.